Four people were hurt when the roof of a bus was ripped off after it crashed into a bridge. 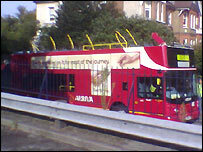 The bus, which was a train replacement service run by Arriva, hit the bridge in Norbiton Avenue, Kingston, south-west London. London Ambulance Service (LAS) confirmed the four injured passengers were taken to hospital with minor injuries on Sunday morning. Traffic was diverted from Coombe Avenue into Wolverton Avenue.